After Mario Draghi, the governor of European Central Bank (ECB), mentioned the possibility of financial easing started in the next meeting of the central bank, the speculation occurred also in the currency market following the European real estate stocks that had been already boosted for months. (See the article on Gecina.) EUR/USD is now traded at 1.37, falling down by more than 1%. The news currently mostly tells about the negative interest rate, not the quantitative easing, but if the other methods couldn’t hinder the inflation rate from diminishing, the ECB would have no option but the QE. Therefore, in this article we estimate the due rate of EUR/USD after the QE. 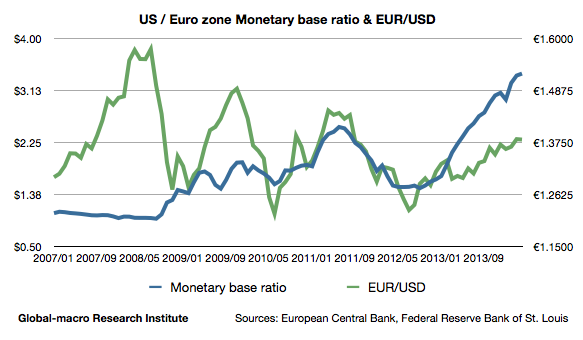 This is the graph of the monetary base ratio of US to the euro zone and EUR/USD. After the financial crisis in 2008, with the unconventional monetary policy having been common, the correlation of the two figures has been getting more apparent. Nevertheless, we also observe that the ratio has averagely been increasing whereas the exchange rate has been in the downtrend. This is presumably because the US economy has been successfully recovering on the contrary to the euro zone that struggled with the bond crisis. In order to estimate the due exchange rate, it’s necessary to guess the size of the upcoming QE. The upper limit should be the size of the LTROs that were held twice between 2011-2012, as a result of which the monetary base increased by 50%. 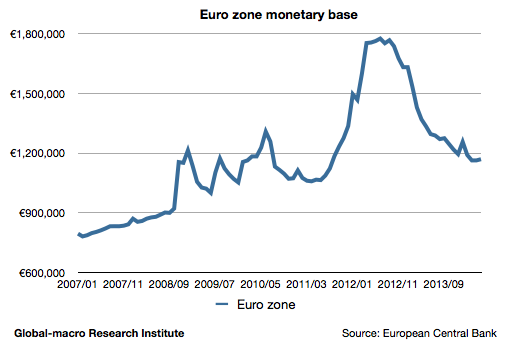 If the euro zone’s monetary base increases by 50% from now, the monetary base ratio will be approximately 2.4, which is the same as the range in May or June in 2013, when the exchange rate was 1.30. Meanwhile, if the ECB fails to increase the monetary base by at least 20%, it won’t stop the inflation rate falling. If we consider this as the minimum size of the QE, then the ratio is 2.9, which is the same as the ratio in September or October in 2013, when the exchange rate was about 1.36. In addition, the US economy is expected to continuously grow faster than the euro zone. In conclusion, the expected range of the exchange rate would be 1.28-1.34 depending on the size of the QE. If Mario Draghi isn’t to adopt the QE next month, he will prefer to spend a couple of months to watch the consequence of the alternative method he takes in June, and therefore the application of the QE will be delayed. When the market doesn’t manage to wait, and the statistics about the inflation don’t improve, then it’ll be high time to sell.